COP21 & Developing Countries | Climate Etc. ← Abnormal climate response of the DICE IAM – a trillion dollar error? The Paris agreement’s failure to achieve the West’s most basic aim: that powerful emerging economies should be obliged to share in emission reduction. For anyone convinced that humans must urgently and substantially reduce their greenhouse gas (GHG) emissions if they are to avoid potential catastrophe, the failure of the UN climate change summit in Copenhagen in 2009 was a serious setback. However the UN summit in Paris last year was a disaster. Copenhagen was only a setback because, although it failed to produce the universal agreement to reduce GHGs that many had expected, it left the door open to further negotiation. That was confirmed at the UN climate summit in Durban in 2011 (COP-17) where it was agreed to work towards a new legally-binding agreement in Paris in 2015 (COP-21) – an agreement the West intended should include GHG reduction commitments from all countries. The USA and Europe are responsible for most remaining emissions. But, as that’s less than 25% of the global total, there’s little they can do, short of closing down their economies altogether, that could make a significant contribution to an overall reduction. 2. The Convention’s distinction between “developed” and “developing” countries – a distinction unchanged since 1992. Developing countries comprised the vast bulk of countries represented in Paris, representing about 82% of humanity including essentially all the world’s poorest people, most of whom have either no or inadequate access to the power sources taken for granted in the West. But they also included major economies such as China, India, South Korea, Brazil, South Africa, Saudi Arabia and Iran, all of which (except arguably the latter two) are far more powerful than they were when the Convention was enacted. 3. Articles 4.7 of the Convention and 4.4 of the Paris text: the former allows developing countries to give overriding priority to “economic and social development and poverty eradication”, whereas the latter merely encourages them “to move over time towards economy-wide emission reduction or limitation targets in the light of different national circumstances”. The fact is that even if every American citizen biked to work, carpooled to school, used only solar panels to power their homes, if we each planted a dozen trees, if we somehow eliminated all of our domestic greenhouse gas emissions, guess what – that still wouldn’t be enough to offset the carbon pollution coming from the rest of the world. But developing country negotiators, led by China and India, ignored the West’s (in the event feeble) demands. And Western negotiators, determined to avoid another debacle such as COP-15 in Copenhagen, didn’t press the issue. Hence the Paris agreement’s failure to achieve the West’s most basic aim: that powerful emerging economies should be obliged to share in emission reduction. Biosketch: Robin Guenier is a writer, speaker and business consultant – now retired. He has an MA from Oxford and is a barrister. After twenty years as CEO of various hightech companies, he founded (1995) an independent business consultancy, Guenier Ltd, specialising most recently in project risk; an early assignment was as CEO of the Central Computing and Telecommunications Agency reporting at ministerial level to the Cabinet Office. He was founder chair of the medical online research company, Medix UK. He has been a regular contributor to TV and radio and has had speaking engagements throughout the world. He has various charitable interests and is a Freeman of the City of London. These notes were written in his private capacity. Moderation note: As with all guest posts, please keep your comments relevant and civil. “The West’s most basic aim: that powerful emerging economies should be obliged to share in emission reduction.” A man who has a watch knows what time it is. A man who has two is never sure. The “West” has one watch at most. The “most basic aim” of the Paris agreement may not be the stated propose. I smell the sulfur. “Yet developing countries are responsible for over 65% of global emissions and the quantity of GHGs they emit is most likely to increase as, for example, they continue to build coal-fired power plants. That’s why Paris was a disaster.” What does than mean… let them eat yellowcake? the kyoto protocol and the unfccc framework taken together is a bureaucratic boondoggle that cannot be implemented and that is why after all those meetings the only agreement reached is the date and venue of the next meeting and why sneaky plots like the SDG and REDD had to be invented. I’ve wondered to myself the following. These treaties and ‘agreements’ are all with entities one would assume to be relatively reasonable. However, we have enemies who seemingly could lay these plans to waste purposefully (thinking ISIS and Taliban as examples here and other could fit that mold). I’ve not seen where this has even been a consideration in any of the discussions. Not intended as an excuse for inaction, but it seems to be something not taken into account. Part of the reason agreements didn’t happen was that the catastrophic events that were predicted, didn’t happen. The panic inducing rhetoric didn’t live up to reality. Two reasons that people showed up was 1) the west thinks that this is a real problem and 2) those that didn’t think that, thought what can I get out of this. Life went on pretty much as normal. It should be obvious to even the most casual observer that this whole initiative has absolutely NOTHING to do with the environment. The agreement is structured in a way that will exacerbate emissions rather than curtail them. That should be the red flag. The REAL purpose lies in the exchange of >$1T between developed and developing countries. This is all about transfer of wealth and establishing a global taxation process. Thank you for this very interesting post. This is excellent news. Now, if the west really want’s the world to cut GHG emissions, it will have to get over it’s stupid obsession with trying to drive nuclear power into obsolesence by never ending scaremongring, protest movements, disruptions to plants during construction and operation, regulatory ratcheting. The developed countries need to look closely at the fact that blocking nuclear is not only blocking progress to reduce GHG emissions from energy use, but also causing around a million deaths per year and the world to be poorer! It will be excellent news only when the West acknowledges that the major emerging economies have no serious intention of reducing their GHG emissions – OK for some, e.g. China, they may “peak” one day, but absolute reduction is unlikely and, in any case, will not be required under what will eventually be the “legally-binding” Paris Agreement. But the West shows no sign of acknowledging and of gearing, for example, its energy policy to that reality. The second figure here http://anglejournal.com/article/2015-11-why-carbon-pricing-will-not-succeed/ shows the cost penalty to participants – those who participate in GHG emissions reduction – of less than 100% global participation. At 50% participation, the cost penalty to the participants would be 250% penalty. However, the quote suggests the countries that are responsible for only about 25% of emissions are likely to participate. But even if countries responsible for 25% of emissions participate, perhaps only 50% of their emissions will be included in GHG emissions constraint measures (Only about 46% of EU emissions are included in the EU ETS). Therefore, only about 12.5% of global emissions are likely to be constrained. This makes a complete joke of the projections of costs and benefits of mitigation policies (and of the estimates of SCC). Many of the IAM analyses assumed 100% participation from around 2015. Some analyses, such as DICE-2013R ‘Copenhagen’ scenario assumed a phase in of increasing participation over time. USA would have a Cap and Trade system in place by 2016 and China by 2020 (at optimal carbon price for all their emissions). Other countries by various dates. 100% of global GHG emissions would be fully priced at the optimal carbon price by 2100; 38% by 2020, 70% by 2040. The red line in the chart below assumes half these participation rates. The quote above suggests even the red line is unrealistic. Therefore, the net-benefit of the mitigation polices would be far lower than the red line on the chart. This reinforces the irrationality of the proposed command and control policies advocated for reducing global GHG emissions. While I applaud the author’s wish for international agreements to be even stronger than they are now, and that we should continue to pursue this strengthening beyond Paris, he is being very harsh on developing countries. These mostly (e.g Brazil, India) have a per capita emission rate that are a fraction of the current global average, and it is unfair to ask them to reduce emissions as they develop. Instead we should be setting target per capita emission rates that drop over time. For example today it is 6 tonnes CO2 per person per year, and India and Brazil in the vicinity of 2 tonnes per capita have leeway to increase in the short term, and should certainly be exempt from having to reduce. Later the target needs to reduce perhaps by 1 tonne per person per year for each decade. This allows development while at the same time cutting global emissions most by those who are least efficient. Now while it is true that the 65% will have to be reduced, it’s obviously awkward for those emitting more than twice as much per capita to demand that without first reducing their own. It says developing countries have 82% of population and produce 65% of emissions. Is that at all surprising? NO! It takes energy to develop. And once developed, nations can consume the benefits that energy provides. Population is part of that, but there too, economic development fosters falling population. Economic development solve numerous problems while changing fuel source solves only one. Ironically, actions which stand in the way of economic development are bad for the environment. So instead of erroneously moralizing about CO2, which up to some point is a net benefit, not detriment, perhaps we should be moralizing about limits to growth which actually make the environment ( and human condition ) worse. Jim D, the author does not express a wish for international agreements to be stronger. I think you are over-interpreting. He merely remarks on the failure of the Paris meeting to achieve the aim set out by, for example, Ed Davey in the quote. The idea of a per capita agreement is interesting but is very unlikely. The Paris agreement has been celebrated as a great success. Is there any chance that negotiators will throw this agreement away, effectively admitting it was a failure, and start again on a completely new basis? The per capita idea explains why developing countries rightfully should be exempt from cuts. Even if they may have not explicitly defined it that way, that is what they are doing with exemptions in the Paris agreement. The author, it seems, would have been happy with an agreement that also forces developing countries to reduce their emissions immediately. This is an extreme view that we don’t normally hear people expressing because it seems inhumane on its face. Maybe he didn’t mean it to sound that way, but that is how it came across. I warn of your over-interpreting, and you do it again Jim, now accusing the author being extreme and inhumane. Bizarre. Saying it’s interesting is even more interesting – it evades Jim D’s point that the author’s “82% of humanity” trick. Yet that could be where there author’s logic leads, PaulM. Go argue with him. Willard, you are as incoherent as usual. I was wrong to say that Jim D was over-interpreting. He is in fact mis-interpreting. Guenier says “82% of humanity including essentially all the world’s poorest people, most of whom have either no or inadequate access to the power sources taken for granted in the West”. Those are clearly sympathetic sentiments, the opposite of Jim’s absurd ‘inhumane’ ‘extreme’ comments. This is what he said “the terms agreed in Paris exempted socalled “developing” countries from any obligation, moral or legal, to reduce their greenhouse gas (GHG) emissions”, and he is very unhappy about Paris for this reason. It’s not subtle what he thinks about developing countries and their GHG emissions, and I have not heard anyone else make the call for these countries to immediately reduce their emissions, which is why I label it as an extreme position with inhumane consequences. The per capita idea explains why developing countries rightfully should be exempt from cuts. It explains why there shouldn’t be cuts at all. The developed world already has falling emissions. That’s because development leads to falling emissions. If you exempt the developing world ( which I think we should ), it doesn’t matter what happens in the developed world because, as Kerry quotes above, even if those emissions went to zero, developing world emissions will continue to be larger – until the developing world is developed. Fortunately, nobody has to cut because the pattern of falling emissions from developed nations will apply the developing nations as well. And of course, AGW is real, but CAGW is a hoax so it’s just an irrelevant exercise of busy bodies who think they get to boss other people around. TE, emissions wouldn’t fall without some encouragement. It is now foreseen that coal should be left in the ground rather than used, so we see that industry on its way out in developed countries. We see countries with oil trying to sell it while the market is there, and it even looks like they are competing with each other for the near-term market rather than saving their assets for later, another positive development from foreseen emissions policies and how they will affect demand. [T]he terms agreed in Paris exempted socalled “developing” countries from any obligation, moral or legal, to reduce their greenhouse gas (GHG) emissions – terms exceptionally unlikely to be renegotiated. Yet developing countries are responsible for over 65% of global emissions and the quantity of GHGs they emit is most likely to increase as, for example, they continue to build coal-fired power plants. That’s why Paris was a disaster. Moreover it’s a disaster exacerbated by the probability that two major “developed” countries – Russia and Japan, responsible for about 9% of global GHG emissions – will continue to burn (even increase) their current levels of fossil fuels. Why is Paris a disaster? First reason: socalled “developing” countries, who are responsible for 65% of global emissions, will be exempted from reducing their emission. Even you can’t argue that this is sympathetic to the poor at all, both the Paris agreement or the poor. This 65% number elides the fact that the West emits more than twice as much per capita. This is why I underlined your “interesting,” PaulM. It’s quite an understatement, since mentioning would be a bit more sympathetic to the poor than not mentioning it at all. Now, think: how can you reconcile the idea that Paris is a disaster because socalled developing countries will be exempted from it, and the “but the poor” card that the author pulled two paragraphs later? You just can’t PaulM. One does not simply whine about the fact that the poor won’t pay, and then the next pretend to stand for the poor. The author needs to be a bit more subtler than that in expressing his symathy toward the poor, PaulM. The author needs to be a bit more subtler than that in expressing his sympathy toward the poor. Oh, and again Jim D invents opinions of Robin Guenier, now claiming that he is ‘very unhappy’. TE, emissions wouldn’t fall without some encouragement. On a per capita basis, US emissions have been falling forty years. Simple economics tells you this will happen – businesses want to become more efficient to become more profitable. Consumers with awareness will not waste energy for it’s own sake ( before auto lights, it was: ‘Kids, turn off the #@!## lights! ). It is now foreseen that coal should be left in the ground rather than used, so we see that industry on its way out in developed countries. Natural gas being cheaper ( a product of economic development ) is what is driving coal out of business. This does get to the crux of the matter. Some people fell compelled to boss others around ( were they bullied as children? ) That’s what governments do, of course, but when governments lie, as in fabricating crises, to justify it – as CAGW is – others get mad. TE, you are saying that the realizations about the CO2 from coal and oil are not feeding into plans for phasing them out. How about increasing fuel efficiency? This is a big change in tune because for a long time skeptics like Steyn were, and may still be, telling us that reducing emissions would collapse the economy, but now some are saying great, let’s continue because it is beneficial after all. This may be the way the skeptics finally transform towards supporting non-fossil-fuel sources of energy and their development. In the end they realize that it is sustainability that matters, and fossil fuels really are already outdated, and I think that realization has finally dawned. Now, if TE can persuade the other skeptics of this, and a movement can be started that affects those in Congress who still don’t like any motion in this direction, it would be great. TE, you are saying that the realizations about the CO2 from coal and oil are not feeding into plans for phasing them out. How about increasing fuel efficiency? Kinda follows from free markets, doesn’t it? Increased cost efficiency implies increased fuel efficiency. Again, no totalitarian government necessary. This is a big change in tune because for a long time skeptics like Steyn were, and may still be, telling us that reducing emissions would collapse the economy, but now some are saying great, let’s continue because it is beneficial after all. Yes, I agree that there is exaggeration from all corners about this topic. However, anytime the government intervenes, it means reduced economic efficiency. Businesses wring energy costs from production. When governments do this, it means businesses become less efficient: they have to hire “compliance officers”, they waste time filling out onerous reports, they have to spend weeks with inspections. This may be the way the skeptics finally transform towards supporting non-fossil-fuel sources of energy and their development. I don’t think it’s skeptics that are standing in the way of alternative energy: “All of the above” right? Economic reality is standing in the way of alternatives. Fossil fuels include storage of energy. Transient sources ( wind, solar, wave, etc. etc. ) do not. By this alone, green energy will always be less efficient and more expensive than fossil fuels. You can add storage ( batteries ) but that will necessarily increase expense, mean lost energy, and increase cost. It will also mean replacing a huge increase in mining, perhaps unsustainably so – so I think you lose all your green points by advocating that. In the end they realize that it is sustainability that matters, and fossil fuels really are already outdated, and I think that realization has finally dawned. Now, if TE can persuade the other skeptics of this, and a movement can be started that affects those in Congress who still don’t like any motion in this direction, it would be great. This goes to the point of made up government crises to boss people around with. People remark on the political affiliations associated with so called “climate change”. This is an example. TE, technological advances are going to allow this trend of reducing emissions to continue, and COP21 sets a much needed target, because that motivates the need for this trend to continue. Perhaps we have not reached crunch time yet according to your way of framing emission reductions as being easy, but there may be a crunch time when emission rates require even more ambitious technological advances to keep up with the 2 C targets. Many countries are changing their energy plans to meet these targets, so again when they succeed by 2025 or 2030 you may still think that looked like natural progress, and what was all the fuss made by those skeptics about. Thank you, Paul – well said. Jim D / Willard: my objective in writing this note was to show that there is no basis for the many assertions that Paris was a success but that, from the perspective of those who believe that humanity must urgently and substantially reduce its GHG emissions and in particular from the perspective of Western and UN leaders, it was a disaster – worse even than the Copenhagen debacle. Note: my point is that it was a disaster only from that specific perspective. As I demonstrated, this outcome resulted from the understandable exemption of developing countries from any obligation, moral or legal, to reduce their emissions. Note that, contrary to Jim D’s assertion, far from being inhumane, I am wholly sympathetic with the one billion or so people who subsist on under $1.9 per day and fully understand why their governments have rejected any suggestion that they reduce their emissions. However this is not a simple matter and is complicated by various factors – for example, in some such countries (e.g. China and South Korea), such people represent a relatively small percentage of their population and their overall per capita emissions are greater than those of the EU. As I’ve said, the Paris outcome was wholly understandable and, given the pre Paris negotiations, should not be a surprise. I am neither happy nor unhappy about that outcome and personally don’t regard it as a disaster. Moreover, after all the Paris hoopla, it is not negotiable: anyone hoping for example that “we” will be able to impose per capita emission rates is living in dreamland. It’s an outcome that means that there is almost certainly no realistic prospect of global emissions being reduced for quite a long time, whatever actions the US and Europe might take. I believe their governments should be facing up to and acting in accordance with this uncomfortable reality. Robin Guenier, thanks for clarifying your position because it certainly came out as though you thought COP21 was a disaster because it conceded too much to developing countries, when now you say that from a perspective of some western countries that appear not to care about developing countries it would be a disaster. You also appear not to trust fast-developing countries like China to turn around their emissions according to their stated plans. I think per capita emissions should be taken into account to determine exempt status. There are complications because countries like China have a lot of per capita emissions but also a lot of manufacturing for export, so it is hard to allocate those emissions to end users, and a fairer method would. Jim D: I suggest you get used to the idea that there is no prospect whatever of the Paris text being renegotiated so as to incorporate your idea of determining exemptions by reference to per capita emissions. It may well be “fairer” but, as I said above, after all the effort expended over all the years leading up to COP21, it’s an idea that can only exist in dreamland. Robin Guenier, I am saying something like that is happening in practice. India only emits less than 2 tonnes per capita and Brazil slightly more. The global average is 6. It makes no sense to restrict countries like this. I am well aware that you don’t consider the Paris agreement as a disaster, and you used this “perspective” as a rhetorical device. That’s par for the contrarian course. But to suggest that unless we get a binding agreement Paris is a disaster doesn’t rest on any readily recognizable sympathy. If I may push further your caricature, it’s like arguing that warmunists won’t be satisfied until they get a one-world government that could kill poor babies more efficiently. Paris could be seen as a success simply because there was an agreement over committing to reduce CO2 emissions. As far as actual reduction goes, any substantial reduction does have an impact on the overall carbon budget, whether they come from developed countries or not, whether they are enforced or voluntary. China and India already signed for 7 465 862 and 1 523 767 gg CO2, which respectively corresponds to a 20% and a 4% reduction. It might be a bit early to project that they won’t ratify their nationally determined contributions. In fact, we don’t even have enough ratification to declare it into force. Moreover, the nationally determined contributions needs to be registered and increased every five years. Article 3 contains a clause according to which countries cooperate and pool their nationally determined contributions. The overall agreement will also be reevaluated every five years, starting in 2023. So no, I don’t think your “now we’re stuck with Paris” has any bite, unless by that you simply wanted to extend the “perspective” for your tongue-in-cheek amusement. Yes, that’s why BAU is the best course, because BAU means falling emissions. There’s no need for your totalitarian government with Green Police. You do realize there are reason for this, don’t you? Large nations use a lot more energy just to get around their nation. They also suffer from some inefficiency – duplicate service spread over a large area. Continental nations use a lot more because they have continental climates ( heating in the winter and AC in the summer ). Poor nations can’t afford to consume household energy. Old nations don’t consume as much as young nations because old farts don’t spend as much, move as much, or do as much. And mostly, unproductive nations don’t expend as much energy as productive nations because they don’t use energy for productive ends. You can stop moralizing about CO2, mostly because of how wrong the predictions of doom continue to be, but beyond that because energy use is beneficial toward human development for all peoples. True. But they’re acting on their own initiative. There’s no realistic prospect that, as you seem to wish, “we” will ever enact an agreement that imposes per capita targets. Eventually – when it’s ratified – there will be an agreement that’s binding under international law. It will enshrine in law the Paris text that exempted developing countries from any obligation – moral or legal – to reduce their GHG emissions. And, as such countries are responsible for nearly 70% of emissions and there’s no realistic prospect of the text being changed, that will I believe be a disaster for those (essentially in the West) who are convinced that humans must urgently and substantially reduce their emissions and, in particular, for US and EU negotiators who had planned to insist that powerful emerging economies should share in emission reduction. Your suggestion that these fact-based observations are a “rhetorical device”, your attempt to compare my position with that of those who make mad assertions about what would satisfy “warmists” and your categorisation of my position as that of a “contrarian” are absurd. (1) There was no Paris commitment to reduce emissions – plenty of aspiration but no commitment. (2) Neither India’s nor China’s INDCs contained an intention to reduce absolute emissions. 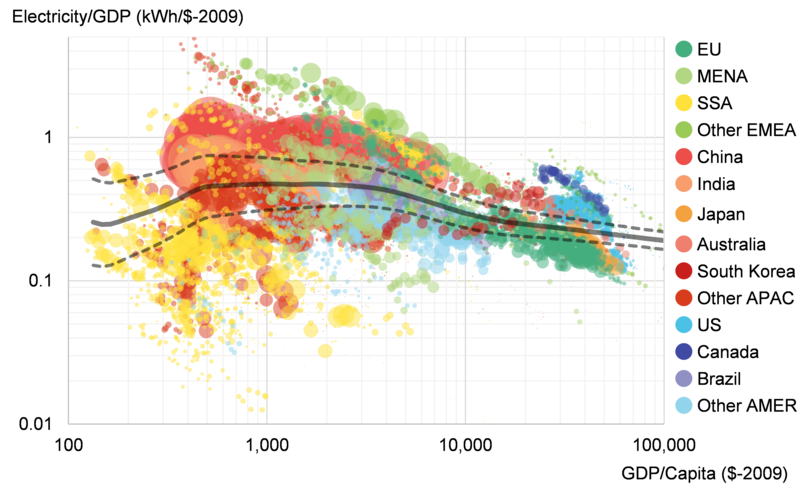 Both indicated improvements in energy efficiency – not the same thing as absolute reduction. China mentioned a peak (around 2030) – but a peak is not the same as a reduction. India didn’t even go that far. (3) It’s true that there’s an obligation that NDCs are registered every five years. But there’s no obligation that any suggested reduction be increased. All will continue to be subject to UNFCCC Article 4.7 and Article 4.4 of the Paris text. (4) There’s no realistic prospect that the 2030 “reevaluation” will effect any significant change: look up the Chinese and Indian rhetoric in the months leading up to Paris. There’s nothing remotely amusing about all this – it’s extremely serious. In fact, it is way less absurd to see that as a cheap rhetorical device than a fact-based observation. You even include the C word. It’s not even an observation, BTW – it’s an inference, an inference about an indefinite amount of people’s mind states. All this based on what you decided was “the West basic aim.” An aim that already failed at Copenhagen. Yet, somehow, the West needed that, otherwise, disaster. Based on two quotes. This is supposed to beat the alternative hypothesis that the West basic aim was to get an agreement signed. > Eventually – when it’s ratified – there will be an agreement that’s binding under international law. The level of NDCs set by each country will set that country’s targets. However the ‘contributions’ themselves are not binding as a matter of international law, as they lack the specificity, normative character, or obligatory language necessary to create binding norms. The BBC might also need to issue a correction. Some of it is legally binding within the United Nations framework. The regular review and submission of emission reduction targets will be binding. So too will the $100bn fund from developed economies to help emerging and developing nations decarbonise their energy mix – which means moving away from burning fossil fuels to clean energy sources, such as renewables and nuclear. What won’t be legally binding will be the emission targets. These will be determined by nations themselves. 1. For some the Paris outcome was a disaster. It’s an observed fact that Paris exempted developing countries, responsible for nearly 70% of global emissions, from any obligation to reduce their emissions. That’s an outcome that’s plainly a disaster for anyone convinced that humans must urgently and substantially reduce emissions if they are to avoid potential catastrophe. Understand now? Or perhaps you think that some of those people are hoping for catastrophe? 2. The West’s basic aim. In 15 months, the world will gather in Paris to secure a legally binding, global climate change agreement with emission reduction commitments from all countries for the first time ever. Hmm – yet you think that just getting something signed could have been regarded as more important? You must be joking. 3. The Agreement will be binding under international law. It will. Here’s an example of what that might mean. Suppose a case were somehow brought at the International Court of Justice against a developing country by another country claiming damage from the first country’s emissions. The first country would be able to show that Article 4.4 (that permits it to emit GHG gases) of a binding agreement protects it from liability. In contrast, a claim that a country had breached its emission target would fail – because (as Wiki and the BBC state) such targets are not binding. It’s a difficult but interesting concept. > For some the Paris outcome was a disaster. Your “some” understates your counterfactual’s antedecent “For anyone convinced that humans must urgently and substantially reduce their greenhouse gas (GHG) emissions if they are to avoid potential catastrophe,” RobinG..
That’s just a mind probing version of the good ol’ CAGW meme. I don’t always look for West’s basic aim, but when I do, I look around Greepeace’s website. is false on two counts, BTW. The INDCs of the largest greenhouse gas emitters included China, which targeted a 60-65% reduction in greenhouse gas emissions per unit of GDP by 2030, the United States, which targeted a 26-28% reduction by 2025 and the European Union which targeted a 40% reduction compared to 1990 by 2030. India submitted a target of 33-35% per unit of GDP, conditional on finance being made available by developed countries. Cue to your prognosis conspiring to confirm your counterfactual. Or perhaps you’d keep on peddling your 65% bogus claim on another thread? That’s not a prediction – you already did. TonyB seems to now appreciate that number. Well played! I cannot take you seriously when: (a) you seem to think some of those convinced that humans must urgently and substantially reduce emissions or face potential catastrophe either don’t regard potential catastrophe as a disaster or actually hope for it; (b) you think it possible that Western leaders might have regarded getting something signed as more important than getting the across all-nation cuts they’d been demanding; and (c) you cannot grasp the idea that a binding agreement could have non-binding provisions. You said: “ you imply that only binding agreements carry any legal or moral obligation. No I don’t – it’s certainly possible for a non-binding agreement to carry a moral obligation. They often do – but not in this context. And you plainly didn’t read your quotation re INDCs – China’s and India’s (unlike the US’s and the EU’s) refer to reduction “per unit of GDP”. Reductions per unit of GDP are not the same thing as absolute reductions – China’s been doing it for over 20 years yet its emissions have grown massively. Due diligence requires close attention. The global stocktake would only falsify my quoted statement if there was any likelihood of it causing the main terms of the Agreement to be renegotiated so as to impose on developing countries the sort of obligations undertaken by developed countries. Close attention to the pre-Paris negotiations demonstrates that – as I’ve said – renegotiation is exceptionally unlikely. Whatever I “seem to think” (a) is none of your business, (b) is irrelevant for your caricature to hold, (c) flips the table too loudly, (d) seldom works in writing, (d) redirects on so many red herrings it’s funny, (e) doesn’t respond for anything you said, and, most importantly, (f) yet again obfuscates your silly counterfactual. Whether binding agreement have non-binding provisions or not, “binding agreement” should not be conflated with “legal or moral obligation.” Even the adequation between binding agreements and legal obligations is far from clear. But hey, since you’re the new Denizen’s lawyer, perhaps you should teach me. Please, do continue to hammer your “but 65%” and the “disaster” flavour of the CAGW meme. Willard: for someone who has been shown to be wrong throughout this mini-thread (including BTW your “bogus” claim re the 65%), you show commendable resilience. Well done, you. I have no idea what your final sentence means – is it possible to hammer a flavour? You constructed an editorial around a counterfactual according to which anyone convinced about CAGW should think Paris was a disaster. You defended this counterfactual by saying it was a fact-based observation. You later tried to minimize it by saying that “some” may think this. Lots of bogusness right there, and that’s just for starters. Your counterfactual is based on an inflation of “West’s most basic aim” (as if Greenpeace was West’s megaphone), an overinterpretation of 4.7 (i.e. it’s not an escape clause), and an underinterpretation of the “shall” that starts article 4 of the Convention (i.e. it does refer to a moral obligation). Again, lots of bogusness, and we’re yet to be done. Misreading the article 4 of the Convention prepares for your “but 65%” usual claptrap, which you sold as a 70% elsewhere. You clarified your position by insisting on “absolute” reductions, futurologized that China won’t abide by its 2030 commitment, and even offered an “most likely” increase prediction, again citing Greenpeace. To see how bogus is your overall stance, Denizens will recall that (a) they can reduce the absolute speed of their car simply by slowing it down, and (b) when they morally commit to reduce the speed of their cars, they don’t need any policeman in the passenger seat to overwatch them. Hmm – let’s see Willard. My paper referred, not to anyone convinced about CAGW, but to “anyone convinced that humans must urgently and substantially reduce their GHG emissions if they are to avoid potential catastrophe”. Surely I don’t have to spell out the difference? My comment about the West’s most basic aim was that expressed by their leaders (I cited Ed Davey and John Kerry). My references to the DECC, EU Commission and Greenpeace papers provided additional evidence. BTW, if you haven’t noticed the long-term and powerful influence bodies such as Greenpeace, Friends of the Earth, Christian Aid etc. have had on Western (especially European) government policy, you haven’t – as I suspect – been paying attention. In contrast to all this, you suggested that Western policy makers could have regarded getting something signed as more important. As I said: you must be joking. Note: it doesn’t start with a “shall” but a “should”. Just as you did re INDCs, this is a misreading that shows you haven’t done the most basic homework. Sad really. And you’re wrong yet again re the 65%: my reference to the European Commission’s Joint Research Centre data supports my claim. Perhaps you didn’t read it – or failed to understand it. My reference to China and its 2030 target was merely that “a peak is not the same as a reduction”. Nothing about China not abiding by it. You made that up – just as you made up your assertion that I cited Greenpeace about a “most likely” increase. Pathetic. Not one of your “bogus” claims is valid. You’re in a hole, Willard – I suggest you stop digging. > My paper referred, not to anyone convinced about CAGW, but to “anyone convinced that humans must urgently and substantially reduce their GHG emissions if they are to avoid potential catastrophe”. Sure, RobinG – “CAGW” can’t paraphrase “anyone convinced that humans must urgently and substantially reduce their GHG emissions if they are to avoid potential catastrophe”. Please stick to CEO stuff. > Note: it doesn’t start with a “shall” but a “should”. Parties that are particularly vulnerable to the adverse effects of climate change in meeting costs of adaptation to those adverse effects. Note: there’s nothing in the Paris text that changes or overrides the essential status and content of the Convention. There are just 118 occurences of “shall” in the Convention, so they might be hard to miss. > Nothing about China not abiding by [its 2030 commitment]. [s]hall periodically take stock of the implementation of this Agreement to assess the collective progress towards achieving the purpose of this Agreement and its long-term goals (referred to as the “global stocktake”). It shall do so in a comprehensive and facilitative manner, considering mitigation, adaptation and the means of implementation and support, and in the light of equity and the best available science. I have no idea to what “realistic prospect” you are referring, RobinG, but signing the Paris Agreement comes with more moral obligations than you may presume. Still digging eh Willard? OK, I’ll take your three latest posts in turn. (1 ) “CAGW” & my words – so you really cannot see the difference? Not impressive. (3) Yes, all parties have moral obligations under the Paris text – plenty of them. But they don’t include a moral obligation on developing countries to reduce their emissions. Note: once a final text is agreed (as happened in Paris) early drafts have no standing. There’s no significant difference between humans must urgently and substantially reduce their greenhouse gas (GHG) emissions if they are to avoid potential catastrophe and the CAGW meme. That “shall” appears throughout the Convention undermines your whole article, if we’re to believe, as you say, that there’s nothing in the Paris text that changes or overrides the essential status and content of the Convention. The “shall” also appears through the Paris Agreement. The most important ones are in Article 4.1, 4.2, and 4.4. You’ve just found a way to extend “but China’s building power plants” to “but developing countries are responsible for 70%, err no, 65% of the total emissions.” Instead of asking “what’s the point,” as you do in your other Internet contributions, you went for your “must be a disaster” caricature. 1. I refer to urgent and substantial reduction. Some – maybe most – CAGW believers may agree that’s necessary. But some think that reduction can take place over time (some, such as Jim D, over decades) – i.e. for them it’s not urgent. 2. The fact that “shall” appears throughout the Convention doesn’t undermine my article in the slightest. The word “shall” does not appear in either Article 4.1 or Article 4.4 of the agreed Paris text. Yet again you haven’t done your homework. Unimpressive. 3. Your last paragraph is incoherent. > I refer to urgent and substantial reduction. Some – maybe most – CAGW believers may agree that’s necessary. Sure, and bananas are not fruits because not all fruits are yellow. Special pleading at its finest. A real lawyer we have there. > The word “shall” does not appear in either Article 4.1 or Article 4.4 of the agreed Paris text. Parties aim to reach global peaking of greenhouse gas emissions as soon as possible, recognizing that peaking will take longer for developing country Parties, and to undertake rapid reductions thereafter in accordance with best available science. There’s no “should” there, which means the obligation is more than moral. There is however a “should” in 4.4 of the agreed text. Which means that 4.4 only carries a moral obligation. So yes, there’s no legal obligation anymore. The 65% still have a moral obligation, however, contrary to what was claimed above. And if there’s nothing in the Paris text that changes or overrides the essential status and content of the Convention, then that moral obligation has legal binding. Note: “shall” is legal and is on its way out; “should” carries a moral oblciation; and the absence of modality can be interpreted as a “must,’ an alethic necessity. > Your last paragraph is incoherent. I’m sorry to hear. Click on The Conversation link I cited elsewhere. Look who wrote the first comment there. 1. My position is simple: Paris is a disaster for anyone who believes action is urgent. For anyone who doesn’t, it may not be. Simple enough; and not special pleading. 2. Re Article 4.1, an “aim” is an aspiration not a commitment. As for 4.4, developing countries have a moral obligation to continue to enhance their “mitigation efforts” – and are merely “encouraged to move over time time towards … reduction reduction or limitation targets”, i.e. they are not under even a moral obligation to make absolute emission cuts. 3. Thanks for the belated clarification. My 2014 comments are still valid and read well. My view that action is pointless is wholly compatible with my observation that Paris is a disaster for those who want urgent action. The “nearly 70%” claim was derived from CDIAC data: http://cdiac.ornl.gov/trends/emis/meth_reg.html. The 65% is from “EDGAR” data: http://edgar.jrc.ec.europa.eu/overview.php?v=CO2ts1990-2014. I now prefer the latter. > My position is simple: Paris is a disaster for anyone who believes action is urgent. For anyone who doesn’t, it may not be. Simple enough; and not special pleading. “If the shoe fits” is a form special pleading, but I was rather referring to how you distanced your argument from the CAGW meme. Your position could be simplified to its main implicit premise: unless developing countries commit to faster and more absolute reduction of GHGs, it is a disaster. Kevin Anderson‘s example refutes it: he accepts that urgent mitigation is required, yet doesn’t believe the Paris Agreement was a disaster. Its main aim may very well have been the agreement itself. I, too, find glimpses of hope behind the Paris Agreement, assuming that countries can get out of the carrot-stick model start and behave like the adults they’re supposed to be. They even succeeded in getting their “shall” (regulative) and “should” (strategic) mostly right. I thank you for having made me pay due diligence to it. It would be easy to find criticisms of that Agreement. The always tactful Jim Hansen used the F word. Kevin Anderson disputes its techno-optimism. So I can simplify my position to this: there’s no need to make it about “the West” or to attribute disaster thoughts. Proving that is too cumbersome and even if you succeed, it makes your implicit position too cynical to be sympathetic. I consider moral obligations stronger than legal ones, but I think we can safely put an end to our exchange. Willard: yes, it’s been an interesting exchange. And I agree it’s time to bring it to an end. However it’s perhaps unfortunate that you cannot quite bring yourself to do so on a rather more harmonious note. For example, it must be obvious to the simplest of minds that there’s a substantial difference between a CAGW believer who insists it’s imperative that emission reduction starts now, with unequivocal participation by the major emerging economies, and a CAGW believer, such as Professor Anderson, who believes the Paris outcome, despite the clear terms of the agreed text, means there’s somehow still time to get it right. But, for the purposes of debate, you insist there is no such difference. And you clearly haven’t got a simple mind. However I’m pleased to note your personal optimism – although no one, even you, can be sure how things will turn out. Like you and Kevin Anderson, I don’t myself see Paris as a disaster. So, in a way I share your position. I don’t even pretend to understand the scientific issues; but my instincts tend to favour the position of Judith Curry over those of Kevin Anderson. And I suppose it may even be possible that China’s got it right. an underinterpretation of the “shall” that starts article 4 of the Convention (i.e. it does refer to a moral obligation). I meant to write “should” – as it is “should” that refers to a moral obligation. I now understand why you wrote “Note: it doesn’t start with a “shall” but a “should”. This may have led us astray. OK, Jim, perhaps it is unfair to ask developing countries to make cuts. How then are we supposed to reduce total emissions? Richard Muller addressed this very well in his talk on the subject. The only humane solution to this problem is technological. In human history that is how most wicked problems were addressed and given human circumstances it may be the only one that will really work. In that case, some uncomfortable choices will need to be made by the Green among us, including abandoning alarming messages about nuclear power and fracking, to name just two. I am actually optimistic that humanity will muddle through and that a long term solution will emerge. The point made here by the author is that those who view mitigation as an emergency should be very unsatisfied with COP21 as it is little more than a political feel good pill. COP21 sets a pace for mitigation that is far from an emergency measure. It is realistic given the pace of technological development, and that the UN also gives priority to reducing poverty in developing countries, which is always going to be a consideration. Some skeptics are upset that it wasn’t more draconian because now it is hard to complain about it, except with pieces like this that say it didn’t go far enough. They will always find a way to complain about the UN no matter what they do. It is not the AMO, that is causing all the climate problems it’s another momo. For what it is worth it looks like Gore is different. How then are we supposed to reduce total emissions? 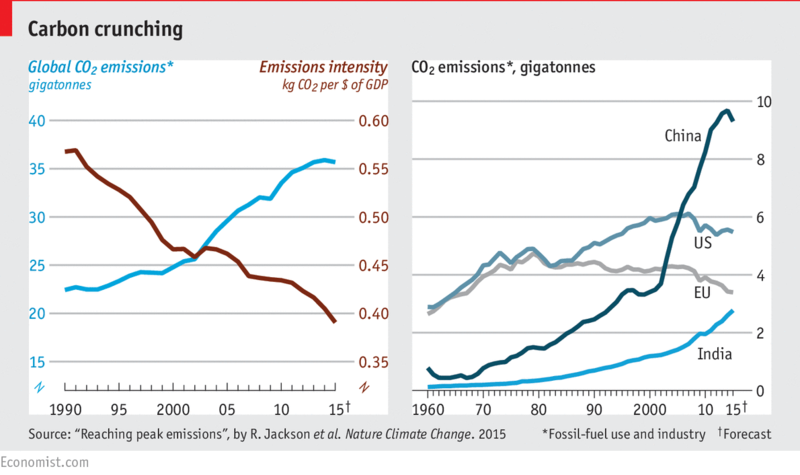 Of course, within error limits, emissions have been flat since 2013 – already peaking? Emissions are already declining for Australia, North America, Europe, and Asia ( though India’s increase cause some rise ). I am not upset that COP21 was not more draconian. I am upset that it is being politically sold as something it is not. It is not a short term or even long term solution and the political complacency resulting from this fantasy that it is will just make any real and effective solutions much more difficult. There are “No Regrets” ideas that will make both you and me happy. CH4 instead of gasoline and coal. Nuclear instead of coal. These things should be done now and will reduce costs and increase wealth. The fantasies of the alarmists and status quo no change people are just distractions. The author was upset that it wasn’t harder on the developing countries. As for, developed countries, they have INDC targets, for example reducing emissions in 2025 or 2030 to some percentage below 2005 levels, and some have already progressed significantly on this in 2016, so the goals are realistic for them, which may be why they were not complained about here. No, he wasn’t. See my comment at 1:04 pm. I dont know why JimD and Willard ignore the advice of physicists. nature only cares about emmission concentrations. She doesnt care who makes them, she just wants them to end. The science is pretty clear. the quicker we go 100% nukes the better. Steven, nobody – including you – knows what nature wants. “I’ve met Mother Nature, and you’re no Mother Nature”. It’s fun to personify nature, but She doesn’t want anything. Doesn’t look like she’s singing just yet. Might wanna hold off on any actual celebration. What does nature want? It didn’t want us to plow up so much of the prairies. It didn’t want us to kill so many buffalo. It didn’t want us to fill our rivers with silt. To disrupt our river in other ways. Nature doesn’t want us to build so close the oceans. To fill our wetlands. Nature didn’t want so much urban water run off. Nature didn’t want us to clear Yellowstone Park of wolves. What does nature want? Nature wants us to get off this rock. Nature wants us to save species of earth by moving them off of here. Without a doubt Yellowstone or some other huge volcano will blow up. What then of all the animal, and plant species ? Would the Buffalo survive? Without a doubt, and they are out there, a huge rock will come to visit. It will cause the death in one blow most, and who knows it could well be all life, on earth. Nature is willing to accept losses at a greater gain. Your idea of what nature wants is short sighted and wrong. What you are asking is to give up the stone hammer before we have a space ship.. The irony is that alarmist and green earth people accuse skeptics of not believing in evolution. And yet, they seem to think that the world has reached a static point, nothing will change or will take a very long time. Change happens in the blink of an eye. I am certain that some of us have talents and abilities that are still emerging. Ones that we have no idea could or might exist. Telekinesis and telepathic abilities could only be scratching the surface. Some day a long island express hurricane will blow into NYC. And NYC will flood, damage will be widespread and severe. But when will that occur ? 100 years ? 200 ? It will recover and until then I will enjoy NYC. No other city on earth like it. The highest and greatest value is human life and the possibilities that we are capable of. That’s what nature wants. We act as if some draconian measures are necessary. We are already well down the road. This is confirmed by the US reached it highest emissions of Green House Gases in 2007 and a subsequent and significant decline from there. https://www.epa.gov/sites/production/files/2016-04/documents/us-ghg-inventory-2016-chapter-executive-summary.pdf Europe has been even more effective in lowering its emissions down almost 25% since 1990 and already below the projected curve of the Paris accords. http://www.eea.europa.eu/data-and-maps/indicators/greenhouse-gas-emission-trends-6/assessment Given these trends, we have been able to absorb the developing worlds increase and still stop the growth of GHGs http://www.iea.org/newsroomandevents/pressreleases/2016/march/decoupling-of-global-emissions-and-economic-growth-confirmed.html So perhaps no great need to turn to radical solutions by junking our present system in favor of heavy reliance on renewables or nuclear. If so a slow. a slow steady course without radical changes to our economy and our life style and a little patient looks like it may well get us to where many people want to be. It is very important for more people to realize that emission reductions are easy and not painful. This is especially true when these reductions are spread over multiple decades. The only immediacy is starting the process now, which as many have now noticed has already happened. Emmisions reductions in co2 are painful and not easy. Perhaps you missed the early fear mongering among CAGW people, that in order to save the planet and to avoid catastrophic disasters we had to essentially stop producing co2 in 2000. CAGW take on the situation was so dire that democracy wasn’t acting fast enough and free markets economies had to be replaced with a system similar to communism. That was/is the UN ‘s preferred model. I think that part of the reason England left the EU was part on the face of it about reducing emmisions, and hidden among the other reasons were the draconian rules and regulations relating to this that was strangling the country. If you think otherwise, you are delusional or ill informed. I seriously doubt that the 25% reduction in co2 emissions lasts. I understand how a gradual process that has already started does not play into the fearmongering of the opposition about mitigation. It’s a tough one. Perhaps you missed the early fear mongering among CAGW people, that in order to save the planet and to avoid catastrophic disasters we had to essentially stop producing co2 in 2000. 1. James Hansen – if we don’t stop our evil ways the oceans will boil off and we’ll get an atmosphere like Venus? The Gillard Government made a position of “Climate Commissioner” and appointed paleontologist and Director of the Australian Museum to be our first Climate Commissioner. Anyone with a coastal view from their bedroom window, or their kitchen window, or whereever, is likely to lose their house as a result of that change, so anywhere, any coastal cities, coastal areas, are in grave danger. According to property searches, in 1997 Professor Flannery bought one house on the Hawkesbury with his wife, Alexandra Leigh Szalay, for $274,000. Five years later—even as climate scientists, including Professor Flannery, claimed evidence of global warming and rising sea levels was even more solid—the couple bought the property next door, for $505,000. For a week, Professor Flannery declined to speak to journalists about his properties, but he broke his silence yesterday to tell The Weekend Australian that while waterfront property generally was at risk, his little bit of paradise was secure for his lifetime. ”There is no chance of it being inundated, short of a collapse of the Greenland Ice Shelf,” Professor Flannery said. Why do you oppose nuclear? Do you know it is the safest way to generate electricity? If nuclear had replaced coal fired electricity generation it could have avoided around 0.5 million deaths in 2015 alone (~ double that if electricity to houses that burn fuels for heating and cooking had electricity). it could have avoided 4.5 to 9 million deaths over the past 30 years. Why do you oppose that? Nuclear could have avoided 75-170 Gt CO2 over the past 30 years. And been about 1/10 the cost by now if not for consequences the anti-nuclear power protest movement. Whats to oppose in removing the impediments that are preventing the world from getting cheap, clean electricity (over time)? Can someone please direct me to any physical evidence (not a GCM) that shows that some (any) reduction in industrial emission of atmospheric CO2 (reduction in coal usage for electricity generation; steel, cement, making) will effect regional or global surface temperatures in any way. Please! Unless the whole world acts in unison, there will be no reduction in global GHG emissions. Any reduction some countries make will be offset by increased emissions from the countries that then produce the goods that previously were produced by the countries that penalised themselves with command and control “carbon pollution reduction schemes”. Can you please direct me to any physical evidence that convincing you is important? Unfortunately, there is no smoking gun. But there are receipts and an empty ammo box. If you want to understand, you will have to get your hands dirty with some atmospheric and radiative minutiae. You could do worse than to read this paper of Manabe and Strickler. If you don’t have the math, don’t worry about the equations. But do look at Figure 1. They took a given 1D atmosphere ( a vertical sounding ) and then considered two cases one starting with every temperature at 160K and the other at 360K. Then, they iterated the temperature adjusted by radiative calculations until each one stabilized. The two soundings tend to converge with a temperature profile that looks close to an average earth sounding. Then look at their next paper and consider figure 16 and table 5. They did the same process for various CO2 concentrations, and came up with about 2.3C for a doubling, including water vapor feedback. That’s consistent with every IPCC pronouncement. But this is for a 1D model – just the vertical. And just the atmosphere ( not the oceans ). So GCMs try to asses including four dimensions and oceans, and all ilk of processes. Now, that is the physical basis, but not clear evidence, for increased CO2 causing warming, which I believe is compelling. I’m not in a blue eyed panic though, because while I believe the case for CO2 causes warming is strong, I also believe the case for warming, at the rates we observe, causing net harm is very weak. Further, demographics indicate that global population will fall which will mean falling demand for everything, making CO2 a moot point. If you want to worry about something, worry about the social and economic upheaval from falling ( and aging ) population. A way to gauge where you are is to see whether you think this trend in the 30-year temperature looks natural or whether it might possibly be responding to the forcing change that has been growing over the last century. Right on. Any reference to a climate is just fogging the real goal – Marxism. Gee, no agreement reached… with all those smart people and such a problem facing all humanity? Robin: The behavior of developing countries is perfectly rational. Climate models suggest there is risk that AGW could reach 4 or more degC, which produces much of the projected damage while accounting for only the high end tail of the pdf. Developing countries can’t afford to “buy insurance” against poorly quantified risk in the distant future – they have far more immediate problems. Extending the tail risk out to 10 degC of warming (without changing the central estimate) would dramatically change the estimated social cost of carbon, but probably not the behavior of developing countries. Given their current problems, debating the difference between a goal of 1.5 or 2 degC is sheer lunacy. Affluent countries can afford to buy insurance against the risk that climate sensitivity is high, though their less affluent citizens might complain about the loss of jobs. Developing countries will not. Either the developed world must pay to reduce emissions from developing countries – likely a political impossibility in democracies – or their emissions will grow like China’s (if they are lucky). As best I can tell, this produced the failure in Paris. Let’s be realistic: The developed world is unlikely to pay much to reduce emissions growth in the developing world. If so, we need goals that the developing world can afford. franktoo: I largely agree with your comment. But, as to your last sentence, I’m unclear who you mean by “we”: the developing world will determine its own emission reduction goals – although currently the determination of any goals looks unlikely. The developing world and the developed world share the same planet. You are trying to fight a perceived danger; your perception is no longer based on failed predictions of Limits to Growth – but they are still based on failed predictions of the Club of Rome. 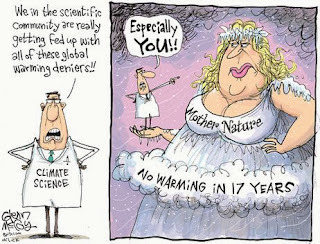 The “physics” used for the predictions – pardon, they are merely projections now – depends on hypothetical numbers which no one has been able to measure so far: an elusive “climate sensitivity” and an “effective radiative level”. Putting these uncertainties aside, to achieve the desired redistribution of wealth, we should stop taxing income and start taxing wealth. I don’t know whether it is consistent with a capitalist model of society. So far, alternative models did not work well. Look at North Korea or Venezuela. The developing world shares the planet with the developed world. The dangers – and risks – are mostly products of the Club of Rome. Their bible Limits to Growth failed miserably in its predictions. Now we have scientific models, most failing already, none reliable, building on a theory which carefully avoids measurable quantities. Two central tenets are the “climate sensitivity” and the “effective radiative level”. None has ever been measured. If we accept perceived risks as real, we should very carefully avoid an approach which would make today’s poor poorer and rich richer. Many attempts at socialism failed miserably – look at an oil-rich Venezuela, or compare the two Koreas. Maybe try a climate tax, taxing wealth, not income. Not easy. A part of wealth is usually invested in good weapons. Sorry – my first comment disappeared without a trace, then reappeared magically. Very good post Robin; it’s a realistic and rational analysis of the Paris agreement. Developing countries simply will not reduce emissions, and anyone who suggests otherwise is deluding themselves. More to the point, independent of what the developed world does, global CO2 emissions will not be falling any times soon, they are more likely to rise than fall. Any proposed policy to reduce future warming must be based on accepting reality, and widespread substitution of solar and wind energy in the developing world is not part of reality. Those who are very concerned about future warming should be doing their best to support substitution of nuclear and natural gas for coal, supporting research on fail-safe nuclear technology (eg. molten thorium salt) and accelerating economic development in countries that are today poor. Scolding people in the developed world and demanding they “pay” for past sins via wealth transfer to poor nations to bribe those nations into use of solar and wind energy may make some people feel smug and righteous, but it is not a policy which is going to be adopted. Any proposed policy to reduce future warming must be based on accepting reality, and widespread substitution of solar and wind energy in the developing world is not part of reality. Those who are very concerned about future warming should be doing their best to support substitution of nuclear and natural gas for coal, … and accelerating economic development in countries that are today poor. [nuclear has been 600 times safer than coal for the past 60 years, and is much safer now] It is plenty safe enough already. We should not delay or slow progress with existing technology while waiting for ‘better technologies. They will become competitive in their own good time as a result of competition, innovation, development, testing, and growing confidence of utilities to invest in them. They have to be cheaper and fit for purpose. They are not there yet. Demonstration reactors do not become commercially viable until there have been many built and operating successfully for an extended period. The present global infrastructure that extracts, transports, refines and delivers fossil fuels provides the CO2 atmospheric increase. For developing nations to increase their own consumption to levels approaching those in the developed nations either means doing it with no change in current global FF consumption, or significantly increasing the global industrial-economic system that performs this process. Peak oil has been and gone. Coal is dirty and expensive except as a local power generator. NG and shale products are possible future sources but would require even more investment in new systems than revitalising oil exploitation in diminishing fields. How credible would it be for the developed economies to invest in such expansion of fossil fuel extraction in the face of consistent pressure that this was risky geo-engineering? Nature may even come in to bat and hit a few more boundary conditions over the next century, although its score so far seems to be 0.9C not out. That will be excellent news when it happens (which it inevitable will … eventually). In the meantime, your post is very good news because it shows the developed world is not going to ruin itself as fast as would have happened if the goals of the alarmists had been achieved. For the world to achieve large reductions in GHG emissions from fossil fuels, the developed world will have to lead the way and make cheap, low emissions alternatives available for all countries. They must develop and make available for all countries technologies that supply energy cheaper than from fossil fuels to succeed. International agreements to implement Command and Control policies that will increase the cost of energy will not succeed. Similarly, countries will not implement policies that raise the cost of energy or, if they do, they will not survive. Nuclear power will have to be a major part of the solution if we want to significantly reduce global GHG emissions. It seems it will have to reach about 75% share of electricity generation (similar to where France has been for the past 30 years) and electricity will have to be a significantly larger proportion of total energy than it is now to reduce global GHG emissions significantly. To achieve this, nuclear will have to become cheaper than fossil fuel generated electricity. 1. The US Administration takes the lead to persuade the US citizens nuclear power is about as safe as or safer than any other electricity generator technology ( http://nextbigfuture.com/2012/06/deaths-by-energy-source-in-forbes.html ). The US can gain enormously by leading the world in developing new, small, modular, flexible nuclear power plants. It can do this by allowing and encouraging innovation and competition, thus unleashing the US’s ability to innovate and compete to produce and supply the fit-for-purpose products the various world markets and different sized electricity systems need. More here: ‘WNN 20/1/15. Radiation health effects’ http://www.world-nuclear-news.org/RS-US-House-passes-low-dose-radiation-bill-2001158.html. e.	The Operation and Maintenance cost of nuclear plants is reduced as the excessive requirements for safety and security decreases over time to the equivalent of other types of electricity generation plant (to AHARS, As High As Relatively Safe). (NPPs have 150 highly trained, well-armed security officers, augmented by comprehensive detection and surveillance systems, on average http://www.nei.org/master-document-folder/backgrounders/fact-sheets/nuclear-power-plant-security . That’s $15-$20 million per nuclear plant site per year (about $10 million per reactor). 5. NRC is revamped – its Terms of Reference and its culture are changed. Licensing period for new designs is greatly reduced, e.g. to the equivalent of the design and licensing period for new aircraft designs. 6. Small modular reactors are licensed quickly. New designs, new versions, new models, and design changes are processed expeditiously. This will lead to more competition, more innovation, learning rate continually improves so that costs come down. 7. The efficiency of using the fuel can be improved by nearly a factor of 100. That is some indication of how much the cost of nuclear power can be reduced over a period of many decades. 8. Eventually, fusion will be viable and then the technology life cycle starts all over again – but hopefully the anti-nuke dinosaurs will have been extinct for a long time by then.